Our card provides the craps player with a playing strategy that will keep the House Advantage to about 1% or less. Our strategy cards make a perfect unique and highly useful gift for yourself or anyone you know who enjoys gambling and wants to win more. Our strategy card provides an easy to follow craps plan which will maximize your odds and have you playing with perfect strategy minimizing the house edge. The card tells you which bets to make according to those bets which have the lowest house percentage. Also noted are which bets never to make under any circumstances shown by the houses odds being over 10%. 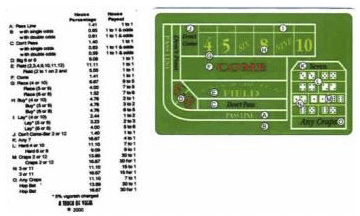 This side of the craps strategy card contains a dice reference chart, showing a pictorial of a craps layout and where all the different bets are placed and what the bets are called.